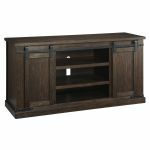 Add a touch of country style to your living area with this 50" TV stand. It’s visually appealing with the flexibility you need. Four adjustable shelves are found behind a barn door that you can easily slide from one side to the other. For an uncluttered look, close up either side of the stand to create a casual feel, great for hiding audio-visual essentials when not in use—what a concept. 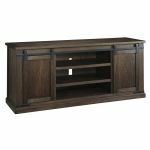 Add a touch of country style to your living area with this 60" TV stand. It’s visually appealing with the flexibility you need. Adjustable end shelves offer lots of storage, while the two stationary middle shelves are roomy for TV components. Two sliding barn doors can easily be positioned as you desire. For an uncluttered look, slide the doors over the two ends and use those areas for hidden storage—what a deal. Add a big touch of country style to your living area with this extra large 70" TV stand. It’s visually appealing with the flexibility you need. Adjustable end shelves offer lots of storage, while the two stationary middle shelves are roomy for housing media equipment. Two sliding barn doors can easily be positioned as you desire. For an uncluttered look, slide the doors over the two ends and use those areas for hidden storage—what a deal.